Mix the flour, salt, sugar and yeast in a bowl. Add the butter, milk and egg, knead to form a soft, smooth dough. Cover and leave to rise at room temperature for approx. 2 hrs. until doubled in size. On a lightly floured surface, roll out the dough into a rectangle (approx. 35 x 45 cm). Mix the lemon curd with 2 tbsp of poppy seeds, spread on top of the dough and smooth down, leaving approx. 1 cm free around the edges. Starting from one of the long edges, roll up the dough. Cut the roll in half lengthwise, twist the strands with the cut sides facing up. 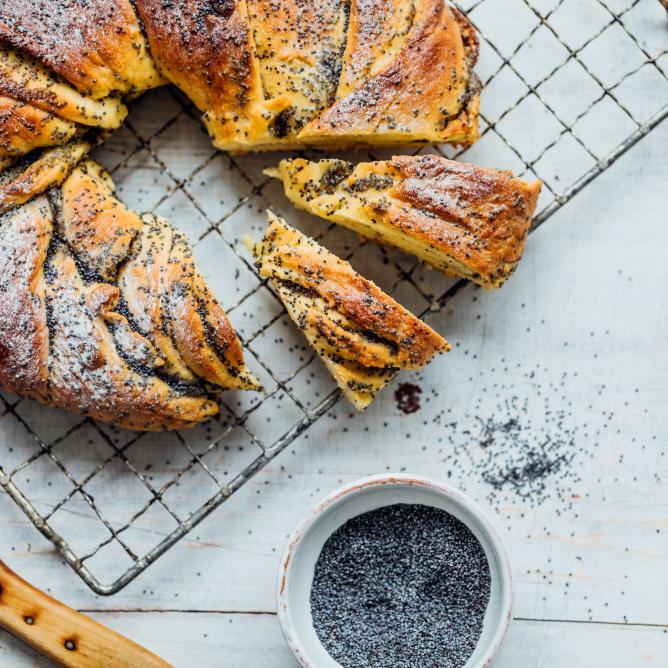 Shape the dough into a wreath and place on a baking tray lined with baking paper, sprinkle with the remaining poppy seeds. Cover the wreath and leave to rise for a further 30 mins. Approx. 25 mins. in the lower half of an oven preheated to 180°C. Remove from the oven, slide onto a cooling rack, allow to cool then dust with icing sugar.